Can someone with EQ take a look? Thread: Can someone with EQ take a look? 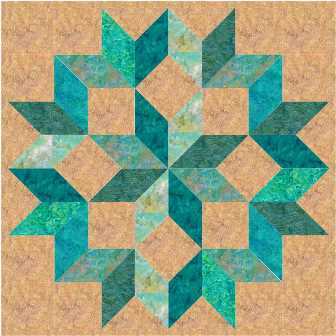 I am trying to envision a Carpenter's Star with batiks in the colors of the beach- aquas, greens, and sand. I don't need any help with measurements, I just need to see if I used a variety of the aquas and greens (mediums and darks) for the star and sand for the background, what would that look like? If quilting is a hobby and you wouldn't mind helping me out, I'd really appreciate it. I have looked all over the QB and I see all kinds of Carpenter's Stars but none in this color scheme. If you are playing around with it and come up with a different design on it but using those same colors, that's great, too. Thanks in advance for any help you might be able to give me. I saw one with those colors on Pinterest, and it was beautiful. If I remember correctly the background was the sea colors and the star itself was more of the sand colors. But I am sure it would be equally beautiful if the color scheme was reversed. Take a look here, you may see one with similar colors. Thank you, Luann! That is what I needed. I thank that'd just about match my friend's new house, but I think to make the blues and greens pop more I'll use a lighter sand color. Thank you so much for helping me visualize this. Wow! That was a great link. I did find some in the color scheme I needed. And tons more that I liked! I love the Carpenter Star. Thanks so much for pointing me in the right direction!